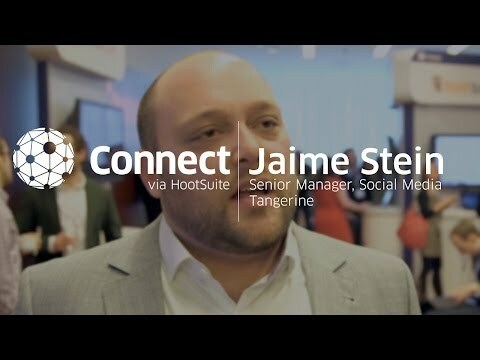 Hootsuite interviewed Jaime Stein, Tangerine (formerly known as ING Direct Canada)’s Head of Social Media, about the importance of their social media banking strategy during the re-branding. In this short video interview shot by the Hootsuite Team, Jaime explains how crucial a role social media had during the bank’s re-branding exercise: they were able to successfully reach out to customer to correct misconceptions as well as provide education and reassurance to their existing customers. Peter Aceto, Tangerine’s President and CEO, is one of the most social CEOs in the worldwide banking industry: Peter, a leadership champion, is an active twitter user who demonstrates on daily basis is commitment to drive both customer and employee advocacy. Jaime tells us the social media team at Tangerine has been busy replicating that success with some other Senior Executives: their CIO, CMO and their Head of Savings and Deposits are now all on social media. ING Direct Canada has been a long-time client and a loyal advocate for Hootsuite, so it’s not surprising to find Jaime happily recommending Hootsuite’s tools and services and especially their ‘Situational Simulation‘. By the way, I invite you to check this recently introduced service which aims to help brands to ‘prepare for emergencies and PR crisis‘. Situational Simulations allow organizations to test their response plans, staff, and technology within a private, controlled environment. The HootSuite Professional Services team works together with clients to plan, perform, and review each simulation, giving them insight into what it takes to be effective during high-pressure situations. Does your financial institution share a similar level of success as the one achieved by Tangerine with their social media banking strategy? How ready are you for quickly and successfully dealing with a major PR crisis and online conversations spreading like wildfire on the likes of twitter or Facebook? I invite you to share your views and your own hands-on experience of PR and social media here, on twitter or on google+.